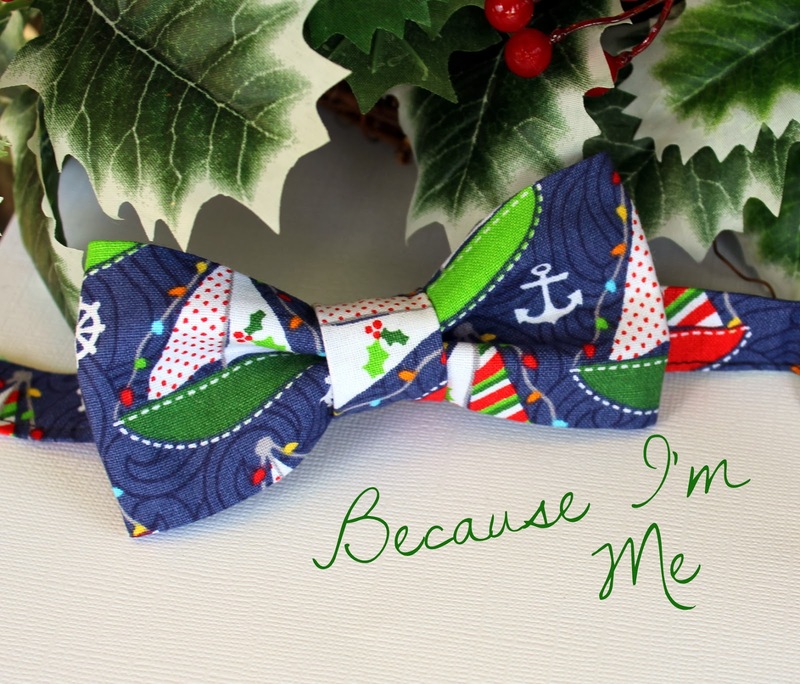 I passed by this fabric many times, thinking the print was just too big for a bow tie. I always came back to it though, those sailboats just stole my heart. Turns out, I was wrong about the size of the print. It looks great as a tie and I'm so glad I went with it. In fact, it's the tie at least one of my boys will be wearing for Christmas this year. 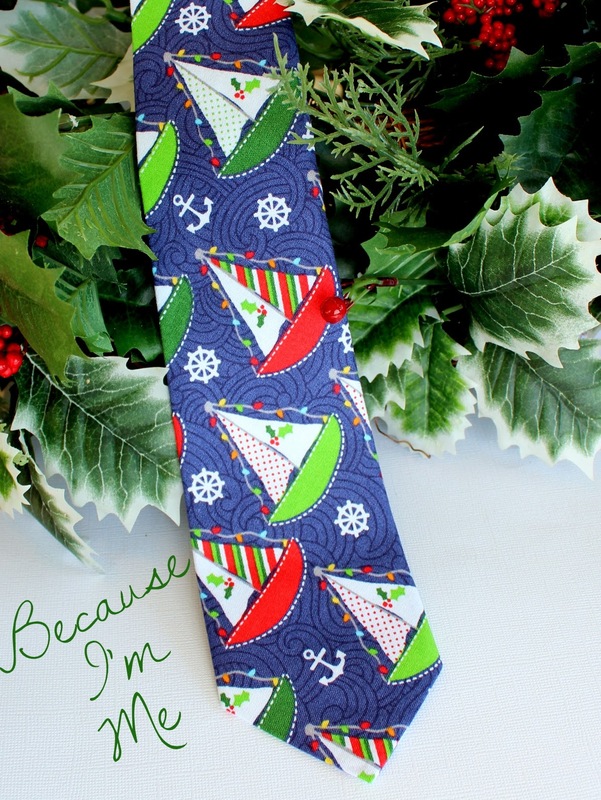 This tie coordinates very well with both the Christmas plaid tie and the Christmas tree tie (picking up the blue in the Christmas lights going up the sails). The kids and I got the boat to the sailing center on a very windy Wednesday. Ian and I rigged it and got it ready to go, all the while wondering if a really windy day was the best day for me to learn to sail. We got the boat into the water where it immediately capsized. Ian and I discussed it a little, while standing in the water righting the boat, and decided he'd take it out by himself to make sure it's in good shape with no leaks or anything, and then I'd go out in it the next day if the wind had subsided some. That worked for me. Ian set off in the boat. Within 2 minutes the boat appeared to have capsized. A few minutes later a coach boat was towing him in. Turns out one of the steel rope "stays" had snapped (there are three steel rope lines that form a triangle to hold the mast in place, they are called stays). I didn't know they could break, but apparently with enough wear and age they can (and do). The boat had not capsized, instead the sail and mast had fallen to one side and into the water when the stay broke. Of course, without an upright mast and sail my little boat is out of the water for the time being. Ian said it was a nice boat for the first minute, no leaks, no other problems at all, he does think it'll be a good boat for me and River. I just ordered the broken parts from a company in Wisconsin. I told the kids I wasn't sure they'd be open now, since it's not boating season up there (the kids thought that was really weird on both counts ... seasonal business and not sailing year round). Sure enough, the phone was answered "hello" only, it's a home phone as well and they don't get much business in the winter. I ordered my part, gave my address, and was told it'd arrive in a few days, and that was it. "Wait a minute ... don't you want my credit card number?" "No, we'll send you an invoice and you can just send us a check". That's the Wisconsin I remember growing up in and love. The ties are available for men and boys in the shop.